Currently browsing posts filed under "Book Reviews"
Jews at Williams: Inclusion, Exclusion, and Class at a New England Liberal Arts College by Benjamin Aldes Wurgaft is both an interesting read and a source for dozens of fascinating anecdotes. Let’s spend a month or so going through it. Today is Day 13. In this, at least, he exaggerates, for Williams was not as inhospitable to the most clubbable Jews as Candlestick makes it seem. Herbert H. Lehman (Williams 1899) was the first Jew to join a fraternity, namely Alpha Zeta Alpha, then a local organization but which later became the national Phi Gamma Delta. His sons and nephews would follow him into the organization decades later. Again, just how antisemitic could Williams have been if Herbert H. Lehman’s wealthy family would choose to send him and if he, after thriving for four years, would choose to be such a generous donor? It is curious that the Class of 1914 contributed so much to the establishment of multi-generational Jewish legacies at Williams. Almost half of the Jews of the Class of 1914 sent their sons on to Williams; as mentioned earlier, the Stone family became a truly prolific Williams legacy, with 10 members attending the college over the generations down to the graduating class of 2005. This means that something of a mystery hovers over the 1910–14 period at Williams. The college was the site of one of the earliest anti-Jewish demonstrations, effectively anticipating far more effective attempts to diminish Jewish involvement in higher education in the decades to come—and yet the Jews of the Classes of 1913 and 1914, present for that protest, nevertheless produced legacies. Students who understood they were part of a group targeted for exclusion nevertheless managed to stick it out, remaining at the college and ultimately flourishing through their association with it. I do not think that words like “curious” and “mystery” mean what Wurgaft thinks they mean. He keeps assuming that Williams was horribly antisemitic and is then surprised by how loyal Jewish alumni are. He needs to re-examine his assumptions. If Williams was, in fact, among the least antisemitic locations in the world from, say, 1900 to 1950, then the loyalty/generosity of Jewish Ephs from this era makes perfect sense. 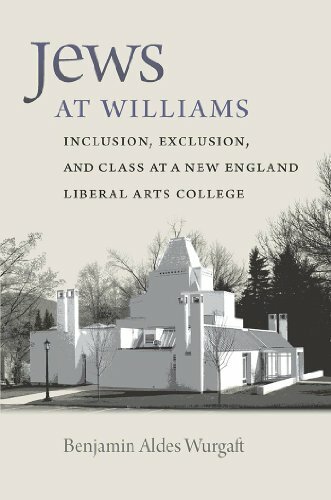 Jews at Williams: Inclusion, Exclusion, and Class at a New England Liberal Arts College by Benjamin Aldes Wurgaft is both an interesting read and a source for dozens of fascinating anecdotes. Let’s spend a month or so going through it. Today is Day 12. Gabriel wrote a study of the problem of being Jewish at Williams, thinly veiled as a coming-of-age novel: The Seven-Branched Candlestick: The Schooldays of a Young American Jew, a tale told in the first person. Truth be told, Candlestick is slight, didactic, and so moralizing in tone that one can almost miss the central social conflict Gabriel took as his focus: the meeting between more assimilated German Jews and their more recently arrived East European Jewish counterparts at American institutions of higher learning. This conflict evidently had at least as much impact on Gabriel’s years at Williams as the conflict between Jew and non-Jew. Emphasis added. Let me revisit two of my favorite themes: First, the conflict of German Jews and Russian Jews at Williams would make for a great Williams senior thesis. Wurgaft covers some of that conflict, but he (purposely?) seemed to leave lots out. To note that German Jews were some of the most powerful and persuasive opponents of admitting Russian Jews is not a theme to gladden the heart of today’s social justice Ephs. Second, Steve Sailer covers this topic here and here. Jews at Williams: Inclusion, Exclusion, and Class at a New England Liberal Arts College by Benjamin Aldes Wurgaft is both an interesting read and a source for dozens of fascinating anecdotes. Let’s spend a month or so going through it. Today is Day 10. Williams was simply an unusual choice for Jews at this point, and not because it presented insuperable barriers to Jews but simply because most had not heard of it. It was off the map for American Jews unless their families had already become acquainted with the social groups from which Williams drew most of its students, or unless some stroke of luck—a chance encounter with an alumnus, for example—informed them about Williams and led them to believe admission was possible. Williams was “protected,” as it were, from Jewish attentions during the gentlemen’s era by the social networks it served. They in turn served it by providing new students and loyal alumni. My hypothesis is that this is exactly the dynamic which drives the lack of discrimination against Asian-Americans at Williams. There is no doubt that Harvard/Yale/Princeton/Stanford discriminate against Asian-Americans, just as HYP discriminated against Jewish-Americans almost a century ago. One current mystery is whether or not Williams (and schools like Williams) employ the same policy. I don’t think we do, not because we are any more moral/non-discriminatory than HYPS, but because proportionally fewer Asian-Americans (relative to non-Asian-Americans) apply to and/or enroll at Williams. But reasonable people differ on the claim about Asian-Americans and Williams admissions. Recall this discussion from more than a decade ago. I miss HWC! Between 1880 and 1920, no other New England liberal arts college was as closely connected to the Social Register families of New York and Boston, a group that, with a few exceptions, emphatically did not include Jews. As Robert Farnum explains, it was the only liberal arts college in the “top five” schools (Yale, Harvard, Princeton, and Columbia are the others) to which the majority of “social registrants” flocked, particularly from the 1880s to the 1920s. It was in fact the fourth most popular destination for registrants from Boston and the fifth for New Yorkers. It was thus part of a tiny cluster of schools serving a social network that crystallized out of the East Coast’s Protestant elite families in the 1880s and 1890s; the first edition of the Social Register was published in New York in 1888. Hmmm. This would make an great topic for a Williams senior thesis in history. Who will write it? Related questions: How much does Williams status today as the #1 liberal arts college go back to enrollment decisions made 100+ years ago by the Social Register? How much were those decisions driven by geography? (My understanding is that the Berkshires were a common summer time retreat for the Social Register folks. Imagine what New York City and Boston were like in the era before air conditioning.) If so, did that familiarity give Williams an advantage over, say, Amherst and Wesleyan? Jews at Williams: Inclusion, Exclusion, and Class at a New England Liberal Arts College by Benjamin Aldes Wurgaft is both an interesting read and a source for dozens of fascinating anecdotes. Let’s spend a month or so going through it. Today is Day 9. However, what is remarkable about the early Jews at Williams (it would be too much to speak of “Jewish life” when only one, or two, or at most nine, Jews were present in a single entering class) is how loyal many remained to the college. Furthermore the first Jewish “legacy families” donned purple during this period. One should not look for conflict between the Jewish identities of these students and their identities as Williams men, for many would not have experienced the unavoidable dissonance between those identities as an incompatibility. If they had, legacies would not have been the result. Indeed. Perhaps the most interesting observation in the book — one that Wurgaft hints at only obliquely in passages like this — is how little antisemitism there was at Williams. Indeed, was any elite institution in the United States less antisemitic than Williams prior to 1960? Reader suggestions welcome. In many ways, this debate is similar to the one about how “racist” Williams is today. Of course, there are people at Williams today who say/believe racist things. (Let he who is without sin . . . .) But such claims are only intelligible in context. There are few places on Earth less marred by racism that Williams today, just as there were few places less marred by antisemitism than the Williams of 75 years ago. Two years after Boas’ address, an increase in the number of Jewish students in the Williams freshman class (the Class of 1914), which included a few students of Eastern European background, would occasion one of America’s first student-led demonstrations against Jewish enrollment at a college or university. German Jews, present in small numbers, never received such a welcome. While no firsthand accounts of the demonstration have been found, President Harry Garfield described it, in a letter, in a secondhand fashion by saying that, afterward, he felt it necessary to take the pulpit in chapel to remonstrate with the students for their bad behavior. Jews at Williams: Inclusion, Exclusion, and Class at a New England Liberal Arts College by Benjamin Aldes Wurgaft is both an interesting read and a source for dozens of fascinating anecdotes. Let’s spend a month or so going through it. Today is Day 8. Are readers concerned that, eights days into our “book review,” we are only now hitting Chapter 1? Reader feedback welcome! At our current rate, we have another 30+ days to go . . .
One seemingly minor but important detail is notable when contrasting Harvard and Williams during this period. Harvard, like so many other elite schools, abandoned its strict Greek and Latin requirement for admissions in 1900, whereas Williams clung to a strenuous set of language requirements into the 1930s, the result being that few students from public high schools could attend. When Franklin Delano Roosevelt, along with 18 of his 22 classmates from Groton, arrived at Harvard in September 1900, 40 percent of their freshman class had attended public schools. Harvard’s demographic river was, in this period, fed by Hotchkiss, Groton, and other prominent preparatory schools (the “St. Grottlesex” schools, as they are often known), and by many public institutions as well. Williams’ river was fed more exclusively by St. Grottlesex, and relatively few Jews—and precious few from more recently arrived Eastern European families—made it from the flood of immigration to the narrower stream of private preparatory education. 1) Wurgaft should have told us more about why Williams required Latin/Greek for 30 years longer than Harvard. Does anyone know? My guess would be that this decision had nothing to do with Jewish enrollment pressures since that came a decade or more later at Harvard. 2) Are there any current Williams admissions policies which analogous to the old Latin/Greek requirements? Not that I can see. Elite schools are very similar nowadays. Williams is a bit different from some of its NESCAC peers in that it requires the SAT/ACT and they do not. But all of its actual peers (Amherst/Pomona/Ivy/Chicago) require those exams so, again, Williams is less of an outlier than it once was. 3) Are there any policies which Williams should implement that would serve a similar function to Greek/Latin requirements? To some extent, the the quota for international students — or, rather, the pseudo-requirement to have a US passport/green card — is similar. Yet, I am more interested in positive changes that Williams could make which would change the mix of students that apply/enroll. Adding a finance major is one obvious example. More emphasis on the Williams College Equestrian Team might bring in more students from families who could become major donors. Many would know President Harry Garfield (1908–34), who was thought by many other college and university presidents to possess a secret formula for keeping Jewish numbers at Williams low. Some would attend classes along with James Phinney Baxter III (Williams 1914), who would, as president, hire the college’s first Jewish faculty members, and who also championed the fraternity system at Williams, which by the mid-twentieth century was a stronghold of anti-Semitic sentiment. It was also during this period that Jewish students from non-German backgrounds began to arrive at the college, and this catalyzed a startling series of conflicts, not only between Jews and non-Jews but also between different kinds of Jews. Calling the fraternities a “stronghold of anti-Semitic sentiment” is a misuse of the term “stronghold.” First, many (half? more?) fraternities had Jewish members! Just how anti-Semitic were they? Of course, there were people at Williams — just as there are now! — who expressed anti-Semitic opinions, or at least opinions that many Jews view/viewed as anti-Semitic. But those people were both in fraternities and outside of fraternities. They were both students and faculty, staff and local residents. Second, there is no evidence that the abolition of fraternities decreased antisemitism at Williams, relative to other schools like Amherst that kept fraternities. Of course, antisemitism was decreasing everywhere in the twenty years from 1950 to 1970. It is unsurprising that it decreased at Williams, as Wurgaft documents. But, if the fraternities were really a “stronghold,” then there abolition would have caused antisemitism to decrease more at Williams than at Amherst. It didn’t, so they weren’t. Jews at Williams: Inclusion, Exclusion, and Class at a New England Liberal Arts College by Benjamin Aldes Wurgaft is both an interesting read and a source for dozens of fascinating anecdotes. Let’s spend a month or so going through it. Today is Day 7. The great irony of the story told in this book is that in the course of the twentieth century Williams itself became more like the Jewish students it had once excluded. Indeed. The elite evolve, a theme that Wurgaft fails to explore with much nuance. On the surface, this book is a conflict between two categories of Ephs: Jews and those who would exclude them. On a deeper level, it is the story of Williams College as an organism, a institution dedicated to maintaining its position among the elite. When treating Jews unfairly was a necessary part — or at least considered necessary by the men in charge — of what “elite” meant, Williams treated Jews unfairly. When maintaining elite status required treating Jews fairly, Williams started doing that. The driving force was never — is never — some abstract committment to justice. The driving force is the need to maintain status. Want to predict what Williams will do tomorrow? Don’t ask what Adam Falk thinks. What Adam thinks doesn’t matter much. Ask what actions are necessary — or at least viewed as necessary — to maintain the College’s status. That is what Williams will do. Indeed. We hear a lot about Gentile prejudice against Jews. We hear little — because Wurgaft writes little — about Jewish prejudice against Gentiles. As Steve Sailer points out, there isn’t even a thought category for anti-Gentilism. We Betas, meanwhile, considered ourselves a rather special breed. Scholastically, we were at the top. In terms of grade averages, we nearly always came out first among all the campus fraternities. We had the most Phi Beta Kappa keys per capita of any house. We looked with disdain at our neighbors down the street, the Dekes, the Animal House, the jocks whose academic scores were in the cellar. Any Deke house members from the 1950s among our readers? Please chime in! I explained that we’d rejected the Choate School because the Choate application at the time contained the question, “Is the boy in any part Hebraic?” My parents had found the question socially offensive and semantically ridiculous. Any more ridiculous than Common App’s insistence today that applicants answer whether or not they are “Asian?” You can’t apply to Williams without answering that question. But, sure, the people who ran Choate back then are moral monsters . . .
[T]he president of Phi Gamma Delta took Bobby aside and said, “Look, we were happy to take you into Phi Gam, and we were happy to take your uncle and your cousins in. But this has just got to stop somewhere. We just can’t keep on taking more and more of your people in. We’d be overrun by you people before we knew it. 1) Does anyone know who the president of Phi Gamma Delta from 1950? It would be nice to hear his side of the story. 2) This is exactly the current Williams policy with regard to international students. Recall this brilliant Record op-ed from 11 years ago. If concerns about too many Jews were offensive/ridiculous 60 years ago, then why are concerns about too many non-US citizens acceptable today? Jews at Williams: Inclusion, Exclusion, and Class at a New England Liberal Arts College by Benjamin Aldes Wurgaft is both an interesting read and a source for dozens of fascinating anecdotes. Let’s spend a month or so going through it. Today is Day 6. [P]art of a larger shift, only complete after the end of WWII, from a system in which private boarding schools supplied Williams with its students, to one in which students were drawn equally from public high schools. A central theme at EphBlog: Williams has changed much less over the last 50 years than most people claim. The College is guilty of feeding this belief with its recurrent claims that Williams is much more wonderful today than it has ever been before. The implication, of course, is that the folks who run Williams today are much smarter and/or less prejudiced than folks like Jack Sawyer ’39, much less Harry Garfield ‘1885. That is an ego-stroking story with, however, little basis in reality. The clearest place to see this trend is in admissions, where, to the extent there have been changes, those changes have been driven by outside forces. We started taking more students from public high schools 50 years ago, not because we started hating (private) Deerfield or liking (public) Scarsdale but because we started getting more interest from high quality applicants from public high schools than we used to get. Williams does not seem to have experienced the dramatic shift in admissions policies seen at Harvard, Yale, and Princeton in the 1920s . . . Correct. Now, we would like to believe the Williams administration was more enlightened and so never would have considered the Jewish quotas — and the rigamarole of “character” assessments associated with them — that HYP implemented. But it is even more likely that Williams was simply lucky. So few Jews applied that we felt no impetus to discriminate against them. Ironically the very term “meritocracy” only came into widespread use long after the quota system was imposed at the Ivies. Conversations about access to elite institutions such as Williams in the 1870s, the 1920s, or the 1940s were not couched in terms of establishing a meritocracy. It was in 1958 that Michael Young published his satire The Rise of the Meritocracy, which playfully attacked the premise that meritocracy could thwart an unjust distribution of wealth and power by presenting a world in which the “best” of the oppressed classes are promoted into the ruling classes—thereby decimating the leadership pool of the former groups, which might have helped to create structural changes that erased inequality at its root. Young’s satire gave great currency to “meritocracy” despite its critique of meritocratic dreams, and it was during the turbulent 1960s that the idea of meritocracy was linked to the goal of making American higher education more diverse. Young’s book is amazing. Highly recommended. Jews at Williams: Inclusion, Exclusion, and Class at a New England Liberal Arts College by Benjamin Aldes Wurgaft is both an interesting read and a source for dozens of fascinating anecdotes. Let’s spend a month or so going through it. Today is Day 5. [F]or some of the informants interviewed for this study, the eventual inclusion of Jews within the Williams family constituted a kind of moral victory over a wicked old order. However, a careful examination of the events and debates that shaped Williams College in the twentieth century reveals not a series of heroic episodes but, instead, a slow progress toward institutional change in which the “actors” were more often impersonal forces such as the gradual diversification of America and of the American academy in general, rather than heroic college students, administrators, or faculty. Exactly right, and a stark difference from the cheerleading described in the Record over Frank Oakley’s role. Given the (superb) academic qualifications of Jewish applicants, the rising wealth of Jewish families, and American society’s ever increasing distaste of anything resembling anti-Semitism, there is no scenario in which Williams does not become completely welcoming to Jewish students over the last 50 years. An easy way to see that this change was inevitable is to note that it occurred at every other school too! Notably, it was not the case that in the first decades of the twentieth century Williams denied admission to all but the sons of wealthy WASPs. Like Harvard, Yale, and Princeton before 1920, Williams admitted students almost solely on the basis of academic accomplishment. However, the specific accomplishments required for admission were ones Jewish students, and students from poorer backgrounds, could rarely boast, and not for lack of ability but for lack of opportunity. Until the entrance of the Class of 1938, Williams required four years of Latin and two of Greek . . . It would be one thing if Williams designed its entrance requirements to exclude Jewish (and poor) applicants, but no accounts suggests that we did. Instead, the men who ran Williams honestly thought such requirements were a good idea, in the same way that the people who run Williams today think that requiring standardized tests is a good idea, even if blacks/Hispanic do much worse on such tests than whites/Asians. Is your argument that there was no anti-semetism at Williams? 1) There was much less antisemitism at Williams than people now believe to have been the case. Many current Ephs suffer from the delusion (take pleasure in the fantasy?) that historical Williams was a bad place, filled with racism, antisemitism, misogyny, classism and a variety of other ills. That’s wrong, or at least a dramatic overstatement. 2) There was less antisemitism at Williams historically than there was at other elite colleges. The clearest example of this fact is that Harvard/Yale/Princeton had explicit quotas for Jewish enrollment while Williams did not. Wurgaft does not provide many (any?) comparisons to places like Amherst but my sense is that Williams also does well on dimensions like early Jewish representation on the board of trustees and on the faculty. Jews at Williams: Inclusion, Exclusion, and Class at a New England Liberal Arts College by Benjamin Aldes Wurgaft is both an interesting read and a source for dozens of fascinating anecdotes. Let’s spend a month or so going through it. Today is Day 4. And yet, during a period when Harvard, Yale, and Princeton maintained either de jure or de facto quotas against Jewish students, Williams had three Jews, members of its class of 1914, on its Board of Trustees. While some Jewish students experienced scarring episodes of anti-Semitism during their time at Williams, for others their identity attracted little or no attention whatsoever. There is a credible case to be made that Williams was the least anti-Semitic elite college in the US during the 20th century. If not us, then who? Which other college had as many Jews on the Board during this period? Not only did Jewish students seek to matriculate at those schools more frequently than at liberal arts colleges, the universities that combined great size and prestige—and perhaps Harvard especially—simply loomed larger on the national scene. While Williams, like other liberal arts colleges, has, through its distinguished alumni and faculty, influenced American cultural and political life out of proportion with its size, Harvard, Yale, and Princeton were ever-present in the popular imagination and more likely to attract students whose families were not already affiliated with them in some fashion. Exactly right. This is connected to the current debate over the Asian-American quota in the Ivy League. Most informed observers believe that Harvard, Yale, and Princeton discriminate against Asian-American applicants. The question, for EphBlog, has been: Does Williams do the same? We hope not! With luck, the same forces that allowed Williams to not discriminate against Jews 100 years ago — mainly a (relative) lack of interest from Jewish applicants — free Williams from discriminating against Asian-Americans today. Informed commentary welcome! While the myth of “Old Abe” Rudnick may have surfaced only once or twice, the myth that Williams maintained a quota limiting Jewish enrollment has surfaced again and again. Many of the interviewees whose testimonies inform this project are confident that such a quota was in place as late as the early 1960s. No firm evidence of such a quota has been uncovered as of this writing, though that falls short of final refutation—however, there is ample evidence suggesting that precious few Jewish students applied to Williams until the 1950s and 1960s. This is the most important conclusion of the book: There is no evidence that Williams discriminated against Jewish applicants. Hooray for us! Jews at Williams: Inclusion, Exclusion, and Class at a New England Liberal Arts College by Benjamin Aldes Wurgaft is both an interesting read and a source for dozens of fascinating anecdotes. Let’s spend a month or so going through it. Today is Day 3. If this was one of the two most anti-Semitic acts that Balka witnessed (in the 1950s! ), then Williams was among the least anti-Semitic places on Earth. I am also always a little skeptical about the actual amount of anti-Semitism that underlies comments like this. Assume that the classmate did not like Balka. What if he had shouted “Fat Turkey” or “Ugly Turkey” or “Stupid Turkey?” Would that be better? Why? Indeed, if Balka were overweight or not handsome or not smart, he might have found these insults much more distressing than one which mentioned his faith. Needless to say, drunken Williams students have been insulting each other for 200 years. That isn’t nice, but it is also fairly endemic to this fallen world of ours. In several of the more recent cases we have investigated at Williams, it was likely that the insultor did not truly harbor prejudice in his heart. Instead, he picked the most wounding words he could come up with. The chef saw me and started shouting all over the dining room, “You goddamn Jew, why don’t you go back where you came from.” A professor who had assumed the task of being present for meals with the students immediately shouted at the chef that he was fired. This brought a round of applause from my fellow students who disliked the chef’s attempts at cooking. The next day I received a message from the administration asking me to please come in for a meeting. When I arrived I was welcomed by a senior administrator, who sat me down and began to apologize for what had happened. He informed me that no anti-Semitism would be tolerated and, intending to offer me comfort, assured me that one of the college food servers had a brother-in-law who was Jewish and that the college purchased its meat products from a distributor who was Jewish. This line of apologies inspired me to ask, “But sir, why do you think I am Jewish?” I saw the administrator’s bulbous face get redder and redder. I actually became fearful for a moment; it seemed possible he would suffer a stroke over his transgression, having named as a Jew someone who was not Jewish. After a pause, I assured him that I was indeed as he had thought. He was much relieved, normal color returning to his face. Again, if open anti-Semitism resulted in getting fired, then just how anti-Semitic could Williams have been? Also, what is the backstory? Who was this chef? What did he do after the College fired him? A central task for every historian is to develop empathy for everyone, not just for the “good guys” in a specific time period. Jews at Williams: Inclusion, Exclusion, and Class at a New England Liberal Arts College by Benjamin Aldes Wurgaft is both an interesting read and a source for dozens of fascinating anecdotes. Let’s spend a month or so going through it. Today is Day 2. I think of myself as having become part of a “double elite” during my time at Williams; elite because of my family’s place in Jewish circles in the Philadelphia area, where I grew up, and because of my later professional accomplishments that Williams made possible. I was drawn to Williams because of its academic excellence and small size—and by the tranquil environment of Williamstown. I knew that the college had few Jewish students, and was reputed to be an upper-class institution open only to students from high-society families who had attended leading preparatory schools. The fraternities were such a dominant presence on campus that, when Jewish students were rejected for membership, they could view it as a rejection by Williams itself. Though many of them came from established families, perhaps the Jewish equivalents of the Social Registrants of Boston, New York, or Philadelphia, this meant nothing to the fraternity brothers. Being part of a Jewish elite was meaningless at Williams. Indeed, only years after graduating would I learn how many Jewish classmates I had really had. All the while I was conscious of the toll anti-Semitism had taken on many of my fellow Jewish students, … and aware that it did not have the same emotional impact on me. These passages hint at a recurrent theme throughout the work, a theme mirrored in the larger society: the difference between German Jews, many of whose families were already elite by the early 1900s, and newly arriving Eastern European Jews, many of them poor and less acculturated to the mores of upper crust US society. Balka, like the vast majority of Jewish students at Williams before the 1950s, was a German Jew, someone whose family’s wealth made the transition to Williams much easier. Jews at Williams: Inclusion, Exclusion, and Class at a New England Liberal Arts College by Benjamin Aldes Wurgaft is both an interesting read and a source for dozens of fascinating anecdotes. Let’s spend a month or so going through it. Today is Day 1. Last Saturday, the College community gathered together for the release of Jews at Williams, a book that details the struggle and growth of the Jewish community at the College from the institution’s founding to the construction of the Jewish Religious Center (JRC). “This is a big deal for this college,” President Falk said at the book release. The book, commissioned by the College, shines a light on both the positive and negative aspects of Jewish life. How much does it cost the College to “commission” a book like this? We amateur Eph historians certainly think it is worth it! Any suggestions for other books? I would love ones about the history of admissions and about the history of the endowment. Wurgaft believes the book deals with two main concerns: “First, the structural factors that contributed to a distinctive pattern of Jewish experience at Williams, and second, the kind of response to that experience that the JRC instantiates,” he said. Jews at Williams examines the minority identity in higher education. “This is a story about college, class and American life, about who has access to which social networks and why and what happens when an immigrant group begins to move into pre-established networks,” Wurgaft said. This seems a strange summary to me. Although the history of the JRC is covered, that history is a fairly small part of the entire story. Of course, if you are speaking at an event hosted by the JRC, you might shade things a bit! To Wurgaft, one of the most important eras in Jewish history at the College was the 1980s. “[This] period matters a lot because it helps us understand what can happen when an institution attempts to engage with the prejudices and unsavory practices of its past,” Wurgaft said. During this time, President Francis Oakley moved the College beyond its anti-Semitic past to a welcoming future. While the fraternity system was disbanded prior to Oakley’s appointment as president, the College’s stigma as an unfriendly environment for Jews plagued admissions and Jewish enrollment. Huh? The book offers zero evidence for this claim. Just how “unfriendly” towards Jews was the Williams in the decade before the start of Oakley’s presidency in 1985? Not very! Also, just how low was Jewish admissions and enrollment? The book offers no details. I think that we have a bunch of fake history in which everyone pretends that Williams was horrible and then, mirable dictu, Frank Oakley saved the day. The truth is probably more boring. After 1965, Williams was as accepting of Jews as any elite college (or at least any elite college located in a rural setting with few Jewish residents) and this acceptance only get better over time, as it did elsewhere. But these improvements were smooth, without Oakley providing a major change from the Sawyer/Chandler eras. By 1995, with the appointment of Hank Payne as Williams’ first Jewish president, the process was complete. Again, the book offers little evidence about this claim. Certainly, there were specific Jewish high school students who did not apply to Williams (or did not enroll once accepted) because the College did not, for example, have (any?) Kosher meal options in the 1970s. And it is a good thing that the College now provides those options. But tossing around terms like “unfriendly” is an unfair slur against the men, like John Chandler and Jack Sawyer ’39, who ran Williams in the pre-Oakley era. For Wurgaft, one of the most important purposes of the book is demonstrating “the persistent importance of social networks in modern times.” Social networking at the College was, until 1962, driven by the fraternity system. Jewish students were for the most part excluded from this system. There was discussion among Williams Jews in the 1950s focused on potentially creating a Jewish fraternity, but the idea was not pursued for fear that it might further divide the already isolated Jewish community. OK. But how can the Record fail to report the most important finding in the book: Williams, unlike Harvard/Yale/Princeton, did not have a Jewish quota. This is the conclusion that most readers who be most surprised about, and impressed by. Instead of being “unfriendly,” the Williams of the pre-Oakley era was one of the most philosemitic elite collegse in the country. That is the central message of the book. Was it even mentioned at this event? EphBlog is powered by WordPress and delivered to you in 1.016 seconds using 29 queries..